Click here for some technical notes on using Google on this site. The table below lists, and often paraphrases and abbreviates, the questions to which we have published answers. The list below is roughly in reverse-chronological order. We have tried to distinguish the questions about technical and performance matters versus those that might be asked by performers and listeners alike (not always an easy call). We also have tried to identify key words and phrases (far from exhaustive indexing). Remember that you can also use your browser’s “find” function (on the EDIT menu) to look for key words on this page. Can you describe your process for analyzing and systematically memorizing large pieces of music? Verdis ^ marking in Otello. Meter changes in Rite of Spring. Orchestras playing behind the beat. What suggestions do you have for starting out, especially how to run the first rehearsal and how to study the score? Is the piano indispensable for a conductor? Are there times when it is actually wrong to follow the orchestra conductor? About Italian notation and errata. When a soloist has a complicated passage and orchestra part is fairly simple (as, in the third movement of the Sibelius Violin Concerto), do you follow or conduct? How do you keep people from applauding inappropriately? I was wondering what advice you could offer to me to help me practice score reading at the piano. Preparing for conducting test where the exercise is to rehearse and make corrections with an orchestra. Why is it that conducting auditions always require playing Bach chorales (four staves) at the keyboard? How do you interpret Tchaikowksy’s indication of ffffff? What repertory [...] for beginning conductors (conducting small ensembles)? Is there any source for scores adapted to the piano? Can you comment on your use of attacca between movements? Can you recommend a good recording of the Jupiter Symphony? 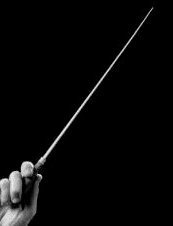 What should I look for in a graduate program in conducting? Also, what tips can you give on getting more exposure to orchestral conducting? Is Brahms traditionally played slower than it should be? What is your perspective on left-handed conducting. When writing music, how does one choose between the time signatures of 4/4, 2/4, or 2/2? It seems that it’s more than a matter of speed. What is the conductor’s role in the music making? Conductor training: scores or gestures? Could you recommend some books on score reading? Any tips on how to improve one’s ability to read scores? I am interested in your reaction to using a synthesizer in composing for acoustic instruments. I was wondering if you have any hints on communicating with an orchestra. What things should an aspiring conductor be working on to help prepare for graduate school? Tempo in Beethoven’s Sixth Symphony (The Pastorale). What are the most important questions that must be resolved prior to your first rehearsal? Prelude to Madame Butterfly, Act 2, Scene 2. Do you suggest any particular aria substitution for Rosina’s lesson scene (Barbiere)? At the beginning of Elektra’s first aria, Strauss has the violins re-tune very briefly. How does this work? Conducting an inborn talent or acquired skill? Comments on Bellinis I Capuleti e i Montecchi (The Capulets & the Montagues), with audio illustration. Does the conductor’s baton go up or down on the beat? Comments on the new Mozart CD (audio sample). About composers conducting their own works. Don’t you think that contemporary conductors and orchestras should incorporate more 20th century music in their repertoires (including recent compositions)? Comments on the new Brahms CD (audio sample). Is it more difficult to do two different operas in the same evening, like Cavalleria and Pagliacci, than to do one? Announcement: Addition of RealAudio® to the site. Does a concerto soloist have the option to change the tempo as desired? About decision-making regarding cuts, repeats, and optional notes. Comments on new recording (audio sample), specifically Mendelssohn’s early violin concerto. When I hear a piece taken at a tempo very different from any I’ve ever heard, I’m inclined to call it “wrong” while my friend defends a musician’s right to his or her interpretation. What is your opinion? Comic and playful music versus “serious" music. Comments on new Beethoven recording, specifically the Eroica (audio sample). Can you comment on working with and without a prompter? Do you work with original instruments? How much consideration do you give to creating historically authentic performances? I hear reference to “tenor clef” and other clefs (usually with a groan). Can you explain what these other clefs are? What was the single greatest influence on your music-making? About ornamentation and decoration (with illustrative audio files). When an orchestra tours with a program it will repeat at each venue, how difficult is it to adjust the playing to the acoustics? What rules of thumb do you follow regarding dynamics and balance? Do you object to surtitles? Overview of conducting technique (use of baton, beating patterns, gestures, etc.). When is a transposition acceptable, and when is it not? Do you have any rules of thumb you follow with regard to repeats and cuts? Has performance practice gone “too far” in insisting on repeats or opening cuts? How do you arrive at an interpretation? Toscanini and the problem of the Act 1 finale of The Barber of Seville (with illustrative audio files). How do you go about planning symphonic programs? In a house where the orchestra pit will not accomodate the forces prescribed by the composer, how are the “pruning” decisions made? What is the most difficult score you have ever had to conduct? Consider searching alternatives in more than one language (e.g., Barber and Barbiere). And note, happily, that Google finds walküre when you type walkure. We didnt test every possible character, so your mileage may vary. Remember that Google may not always be searching the latest version of a page or a site. We are considering other search options.